Perfect for Project Power applications. Allows you to control heavy-duty loads with lower-power switching logic (or even a simple toggle switch). 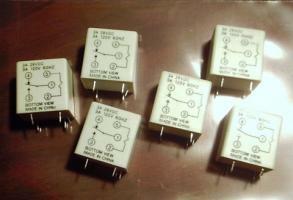 These relays are New Old Stock and are in original condition. They are Single-Pole, Single-Throw type relays, w/ Common, NO and NC connections. The markings on the side indicate: T70L5D131-06, 3A 28VDC / 3A 120VAC @ 60Hz. Our tests indicate that the relay engages at approx ~9-12VDC. The relays have PC-mount pins. You get a whole bag of six relays. Regularly $5.49 each -- Our Special: All six for $24.99.